Gilder Lehrman Collection #: GLC02429.35 Author/Creator: Hemans, Daniel W. (fl. 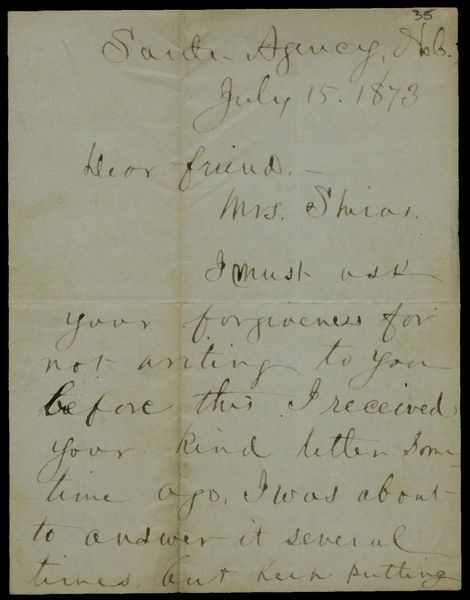 1872-1881) Place Written: Nebraska Type: Autograph letter signed Date: 15 July 1873 Pagination: 4 p. ; 13.6 x 10.5 cm. Summary of Content: Discusses building a house and garden on his land in Bazille, his health, and his work. Mentions a possible transfer to the Chapel at Bazille Creek, on the recommendation of Bishop William Hare. Comments on the growth of his son, who he speaks to in both English and Dakota. "I have working in my garden at Bazille, I made fence around the garden myself, and trying to make a log house near the chapel. And I came down ...on Fridays, then I preparing my Sermons on Saturdays for Sundays, so you see that I have too busy this time & have not much time to write. I have now all the logs at the place, but I have no flooring and doors\85there is no lumbers on the Agency, and I can't buy Some myself, because I have no money\85I bought a wagon\85we can't come down on horseback after issue meat every week"
"Mr H. gone up to Red Cloud in June\85but has not back yet." "My health is little better this summer, though I have pain in my lungs sometimes after preaching, but I am able to do every thing. Bp. Hare & Mr Hinman they wanted me to take charge the Chapel at Bazille Creek. One of the Santee catechists would help me on Sunday Services. So I would do very well there." "Our darling Ally is very well and getting grow, he can run fast & walks around the house with his mother. He can say few words in English and Dakota. He understoods better, but can't speak yet."